Portraiture had been an important genre of painting since the early 17th century in Britain. Lady Anne Hamilton (1766-1846) was the eldest daughter of Archibald, 9th Duke of Hamilton. She became lady-in-waiting to the Princess of Wales (1768-1821), the future Queen Caroline, and remained in this position until 1813. She continued to be a staunch friend after the Queen left England in 1814, and took up residence with her in Portman Street, Portman Square, London, after Caroline's return from the Continent in 1820. She accompanied the Queen's body to Brunswick for burial after her death in 1821. However, the only legacy she received was a picture of the Queen. James Lonsdale (1777-1839) exhibited two portraits of Lady Anne at the Royal Academy, in 1805 and in 1815. 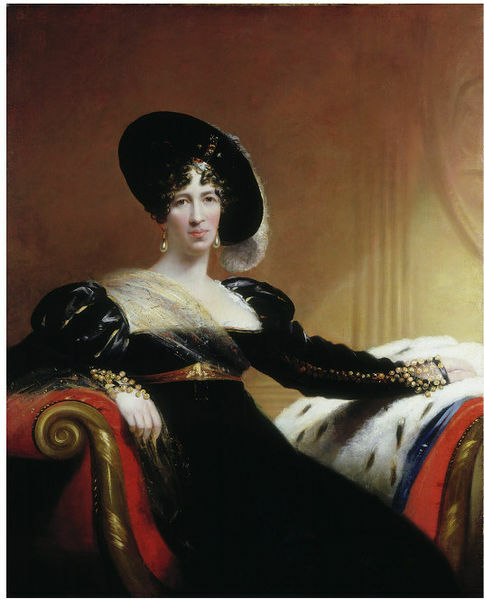 Judging by the costume, the present picture is thought to be the one exhibited in 1815. Lonsdale also exhibited at the Royal Academy two pictures of Lady Anne's father, the Duke, and one of her brother, Lord Archibald Hamilton, the political reformer. Lonsdale's work is obviously influenced by his more successful contemporary Sir Thomas Lawrence (1769-1830). Lonsdale, a pupil of George Romney (1734-1802), became a fashionable portrait painter himself, and was one of the founders of the Society of British Artists. Bequeathed by Mrs White, 1877. Historical significance: James Lonsdale (1777-1839), portrait painter, was born in Lancaster and first worked as a pattern designer at Margerison and Glover's print-works, Catterall Lancashire. In 1799 he moved to London where he was briefly the pupil of the portrait artist George Romney (1734-1802). In 1801 he entered the Royal Academy Schools. In 1809 he exhibited a portrait of the Lancaster architect Richard Threlfall. It was through this contact that he began to receive commissions from Archibald, ninth duke of Hamilton (1740-1819). He exhibited 138 works at the Royal Academy and 87 at the Society of British Artists between 1802 and 1838. In 1820 the lord mayor of London commissioned a portrait from Lonsdale of Queen Caroline (1768-1821). In a stipple engraving after the portrait by Henry Meyer, Lonsdale is described as 'Principal Painter in Ordinary to the Queen'. This description has recently been questioned by Cross in his biography of Romney (See Cross, p.241). In his portraits Lonsdale incorporates accurate observations that often resist flattering his sitters. This portrait is of Lady Anne Hamilton (1766-1846). She was the eldest daughter of the Lord Archibald, 9th Duke of Hamilton (1740-1819). She was lady-in-waiting to her friend, Caroline of Brunswick, as Princess of Wales until the princess's foreign journey in 1813. In 1820 Lady Anne Hamilton met Caroline, now Queen at Montbard, France on her return to England, and they entered London together. Following her return to England the Queen took up residence with her in Portman Street, Portman Square, London. Lady Anne is documented as accompanying the Queen on many key moments in her later years including the abandonment of the Pains and Penalties Bill, which had been initiated in 1820 to strip her of the title of Queen, and the subsequent procession to St. Pauls to return thanks for her acquittal. When the Queen died in 1821 Lady Anne was present at the internment of her body in the royal vault at Brunswick, Germany. In 1832 a person who knew Lady Anne obtained from her a variety of private information and published, without her knowledge and much to her regret, a volume reporting to be written by her entitled "Secret History of the Court of England from the Accession of George II to the Death of George IV". A reprint appeared in 1878. She died on 10 October 1846 in White Lion Street, Islington, and was buried in Kensal Green cemetery. In this portrait Lady Anne Hamilton is show seated on a stool in an interior setting. She wears a dress of black velvet. Around the high empire waist the sitter wears a gold belt, possibly of silk. The square neck and puffed sleeves are also edged with gold. On her head she wears a large plumed black hat, which is decorated under the brim with a band of jewels. The luxury of her clothes is continued in the setting, with the sitter being seated on an ermine fur which is draped over a couch of red velvet and gold painted woodwork. 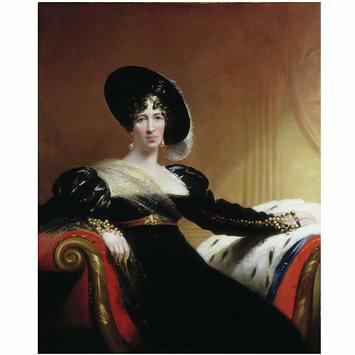 Lonsdale exhibited two portraits of Lady Anne Hamilton at the Royal Academy, the first in 1805 (number 198) and the second ten years later in 1815 (number 135). Judging by the costume and age of the sitter this is probably the later of these portraits. 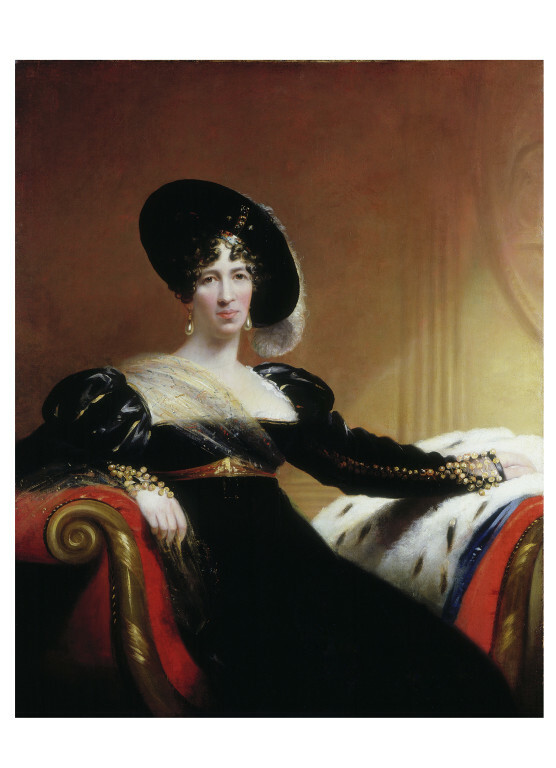 The style of the pose, which shows the sitter alert and directly looking out at us, can be compared to the work of Sir Thomas Lawrence (for example see the similarity of pose in Lawrence's Caroline Amelia Elizabeth of Brunswick NPG 244). As well as the two portraits of Lady Anne Hamilton, Lonsdale also exhibited at the Royal Academy two portraits of the 9th Duke of Hamilton (in 1804 and 1819) and one of her brother Lord Archibald in 1822.